In 1938 Arrowmen of Bobwhite Lodge 87 in Augusta, GA helped charter Tsali Lodge 134 of Daniel Boone Council in Asheville, NC. The Lodge was named after the Cherokee Chief Tsali who sacrificed his own life so those of his people could remain in the Appalachian Mountains. The lodge totem is that of the “bow”. Within the bow are two letters of the Cherokee alphabet, which spell out Tsali’s name. For many years the lodge flap pictured the lodge’s totem and five Cherokee Indians that represent Tsali, Tsali’s Brother, the Cherokee chief Utsala, and Tsali’s two sons. 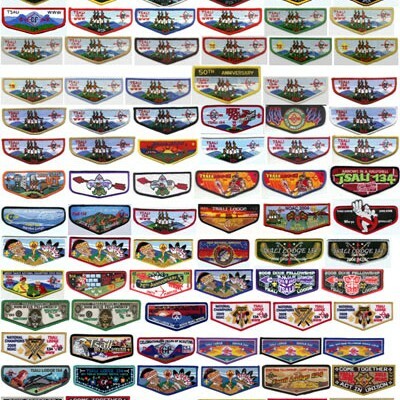 Though these are not the current issue, the design was in use for several years and many lodge members will still have them on their scout uniforms. Tsali commemorated 75 years in 2013 with a flap (S88) and jacket patch (J8). These patches were designed by Bill Dyar, the lodge Indian Affairs adviser and national champions dance team adviser. There were 200 jacket patches produced and 300 flaps produced. Submitted by Website Editor Hank Birdsong Please Leave Comments Below!